Painting lesson #44: I show how I painted this winter scene and moonlight shining on a mountain cabin and snow for making Christmas cards using acrylics on cotton canvas 11 x 14 inches (28 x 36 cm). I show how I painted every part of this painting in detail. In addition, I show the supplies that I used including the paint , brushes, palette and easel. In this painting lesson I give away the secrets of making a successful professional painting. I share acrylic techniques that took me years to acquire on my own so that you won't have to wait that long. It is a small investment that can propel your artist talent in a better way. 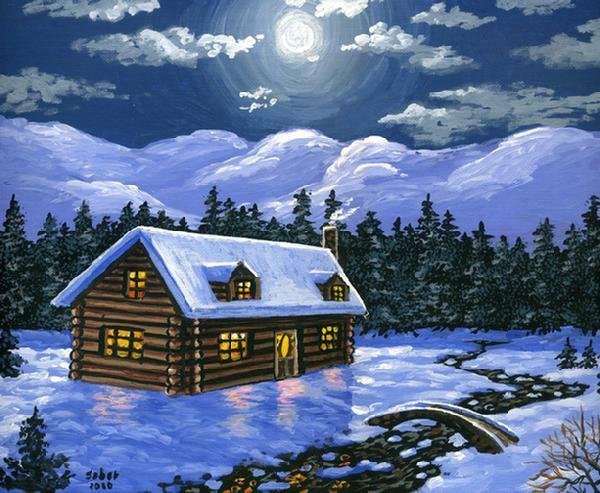 In this painting lesson I will show you how I painted the image above, a gorgeous cabin in the snow surrounded by mountain and illuminated by the moonlight, a great painting for a Christmas card . I explain a step by step process from the beginning of the painting all the way to the end. I will show and describe in detail how I mix every color and apply it to the canvas. In addition, I give away the technique to improve the painting and make it look more professional.